We know that people need useful and relevant information to help navigate the electoral process. You may have used Google’s Search tools for past Australian elections, where we highlighted information that helped people understand and participate. For the Australian Federal Election this year, we’ll be working with information from the Australian Electoral Commission to help people find the information they need to enrol and vote. We're working with political parties to help them understand digital best practices to ensure Australians can find the information they are looking for when they are searching online. We are also sharing Google's ads policies with parties and candidates in the lead up to the election. Our goal is to make information as accessible and useful as possible to voters, practitioners, and researchers. We’re continuing investments in keeping our own platforms secure and are working with parties, election officials, journalists and other organisations to offer our security expertise. For the 2019 Australian Federal Election, we’re offering in-person security training to the most vulnerable groups, who face increased risks of phishing attacks. We’ve been in Canberra in recent weeks providing training for government agencies and parties. Our training promotes Google’s Advanced Protection Program, our strongest level of account security, and Project Shield, a free service that uses Google technology to protect news sites and free expression from DDoS attacks on the web. Australians rely on quality news content to navigate busy election periods and Google News Lab will support the Australian Associated Press (AAP) in its election verification service, which will send alerts to newsrooms around the nation. They’ll be offering workshops to help journalists access the latest tools and technology to tackle disinformation and support their coverage of the elections. Like others, we’re thinking about how we continue to support democratic processes. We’ll provide more information on these areas and our efforts to inform, protect and support elections in coming months. As Australians head to the ballot box in coming months, we’re rolling out products and updates to help people get the information they need to cast their votes. Here are some ways we’ll be providing support. skills training event at the Google office in Sydney today. The Digital Garage, ahead of this weekend’s Sydney Mardi Gras celebrations, was designed for LGBTQI+ individuals and allies who own or manage a small to medium sized business and wanted to learn new skills to help their business be found online. Partnering with the Sydney Gay and Lesbian Business Association, participants heard how to get started with digital marketing and other digital tools, including our free online skills training platform The Digital Garage. Federal Member for North Sydney, Trent Zimmerman MP opened the event and spoke about the importance of supporting small business and Mardi Gras. We also heard from Sydney marriage celebrant Stephen Lee - one of more than 290,000 New South Wales businesses that use Google to connect with customers around Australia and the world. Stephen shared how Google has helped his business to be found online. At Google, we believe that everyone should have the opportunity to learn the skills necessary to succeed online, that’s why we developed The Digital Garage and why we are hosting events for small businesses all around Australia. This is the second time we've partnered with the Sydney Gay and Lesbian Business Association to run a Digital Garage training for the LGBTQI+ community. We’re proud to support Mardi Gras through events like today’s and the Mardi Gras Parade Grants Program - happy Mardi Gras! More than 80 business owners and operators attended the Digital Garage for Mardi Gras 2019 skills training event at the Google office in Sydney today. , which aims to provide free training for up to 4,000 journalists and students in Australia and New Zealand. This week we announced a partnership the Walkley Foundation to develop a training network across Australia to support a sustainable future for journalists and make sure that journalists and media organisations have the digital skills to succeed at their craft. We have worked with the Walkley Foundation since 2013 to deliver a wide range of programs and activities to help ensure the long-term viability and sustainability of journalism. Walkleys chief executive Louisa Graham said the program supports the Walkleys’ mission to support a sustainable future for journalists, connecting Australian and New Zealand newsrooms, journalists and students with this free training to boost their skills for digital reporting and verification. Earlier this month, The Walkley Foundation appointed John Bergin, former digital editor at SBS and director of digital news at the Australian News Channel, to manage its Google News Initiative training program. The training will help journalists to understand how to use online tools that refine information and analyse trends, how to use satellite imagery to enhance your storytelling and develop insights to connect content with audiences and to make it more discoverable. For more information check out the Google News Initiative or contact the Walkley Foundation to register your interest here. The Walkley Foundation has been fostering innovation in Australian news gathering and storytelling for decades and we couldn’t think of a better partner for the Google News Initiative, which aims to provide free training for up to 4,000 journalists and students in Australia and New Zealand. When I started working at Google almost 12 years ago, Australians were still figuring out how to make the most of the internet. Today, few of us could imagine a day without a smartphone in our pocket. Google provides tools and services that millions of Australians use every day, such as Search, Maps and YouTube. Thousands of Australian businesses are benefiting too, using online platforms like ours to reach customers across Australia and globally. In its Digital Platforms Inquiry, the Australian Competition and Consumer Commission (ACCC) is considering the impact of these changes, with a particular focus on news and journalism. The ACCC notes the Internet has helped consumers to access a broader range of news publications, as lower production and distribution costs have sparked competition from new entrants, both locally and around the world. As this occurred, traditionally profitable sections of newspapers such as real estate and classifieds have faced new competition for advertising dollars, not just from platforms like Google, Facebook and Amazon, but also from Australian digital success stories like SEEK, Domain and REA. In short, as Australians have increasingly gone online, so too have advertisers. The ACCC’s Preliminary Report proposes a number of regulatory ideas in response to this transition. We have engaged with the ACCC throughout this process and this week submitted our response to the Preliminary Report. Underpinning our submission is a belief that as technology evolves, legal frameworks must also evolve with clear, evidence-based solutions to address specific problems. It’s sometimes claimed that the internet is unregulated but that's simply not the case. Considered, carefully calibrated regulation has contributed to the web’s success as a platform for expression and access to information. We respect the range of existing laws and regulations that apply to the internet, such as competition and consumer laws and advertising regulations. This inquiry provides a timely opportunity to review and consider existing frameworks in light of rapid change. When Australians search for news on Google, we want to surface high quality, relevant and useful results. In 2018, we referred more than 2 billion clicks to Australian news websites. These clicks amount to free traffic that helps publishers generate ad revenue and provides the opportunity to turn casual readers into loyal subscribers. We also provide ad technology to large and small publishers to help them monetise content through advertising. In 2018, we paid US$14.2 billion to partners globally - more than 70% of the revenues earned from displaying ads served by Google on partners’ properties. Google News has no ads, nor does the news results tab on the search page. Unlike social media sites, which operate in largely closed environments and benefit from users spending more time on the site, the success of Google Search relies on linking users with relevant results. This is an important distinction, highlighting the need to differentiate between digital platforms. While Google supports news and journalism, some of the Preliminary Report’s recommendations - such as an algorithm regulator - risk poor outcomes. We already provide extensive guidance on search ranking, including our 164 page Search quality rater guidelines, and the How Search Works guide. And of course, Google Search results are open for all to see. We believe this approach balances the need for transparency against the risk of manipulation by bad actors and do not believe that an algorithm regulator would lead to higher quality search results or promote journalism. Australians search for a wide range of queries every day and expect to get the most relevant and useful results, as quickly as possible. While Search is very popular, we have a lot of competition. From a consumer perspective, Google competes for user queries with other search engines, and specialised search services like Amazon, e-commerce sites and travel aggregators. From an advertising perspective, search advertising is just one of many channels advertisers invest in and we compete directly for advertising dollars with other digital channels, as well as television, print, radio and outdoor advertising. The popularity of digital is, in part, due to the unprecedented ability it provides for advertisers to measure the impact of their ad spend and other media channels are fast catching up. This is not examined in the Preliminary Report and we believe there should be further consideration of the competition Google faces for user queries on search and the competition for advertising investment, both among digital providers (of which search advertising is only one part) and other forms of advertising. Australians trust us to protect their privacy and data, and we take that responsibility seriously. Through Google’s MyAccount we provide easy to use tools that give people transparency, choice and control over their data. In 2017, Australians visited MyAccount more than 22 million times, reviewing and adjusting their privacy settings to manage what information is collected and how that data is used. The Preliminary Report proposes a range of measures to enhance privacy and consumers’ awareness of data collection and use. We believe these changes should apply to all organisations currently subject to the Privacy Act, not just digital platforms or organisations that meet a particular threshold. The ACCC’s preliminary report provides a timely opportunity to examine Australia’s changing media and advertising landscape. As we continue to engage in this process, we do so with the goal of balancing the benefits of new technologies, minimising societal costs, and respecting fundamental rights for all Australians. A recent report from Alphabeta highlighted the changing nature of work due to developments in technology and automation and looked at the skills the Austrailan workforce will need to thrive in the new economy. We were delighted to join Shadow Minister for the Digital Economy, Ed Husic in partnering with nonprofit organisation Schools Plus to support a STEM-themed school program and Robotics Club at Doonside Technology high that will see seven schools - Crawford Public School, Doonside Public School, Doonside Technology High School, Evans High School, Marayong South Public School, Plumpton High School and Walters Road Public School - receive support to significantly expand students’ access to digital technologies and STEM learning activities. We’re providing $45,000 in funding as well as mentoring and professional development with some of our amazing Google colleagues to introduce more STEM education for students. 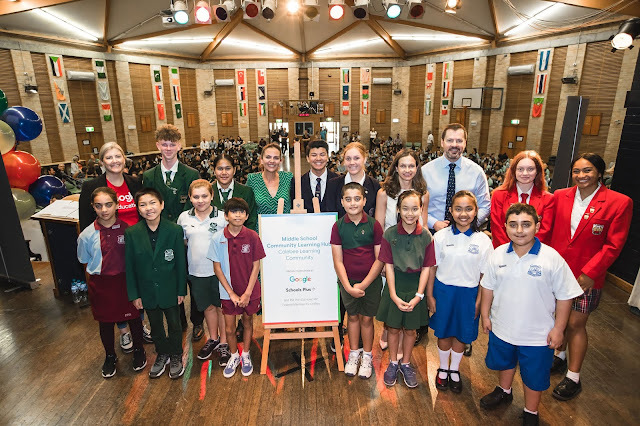 This is the third project Google has funded with Schools Plus, taking our total contributions to over $100,000 including Balga High School (WA) and Madison Park (SA). We've long been supporters of computer science and STEM education in Australia - supporting over 12,000 teachers through Google Educator PD grants, reaching new students across the country and giving them access to a world class robotics program with FIRST robotics, and delivering professional development training to over 35,000 teachers (and counting) across Australia through our collaboration with the CSER team at the University of Adelaide. Future innovations and inventions in Australia will come from students gaining skills in computer science today, and blending that with other disciplines to solve challenges the world faces now, and in the future. 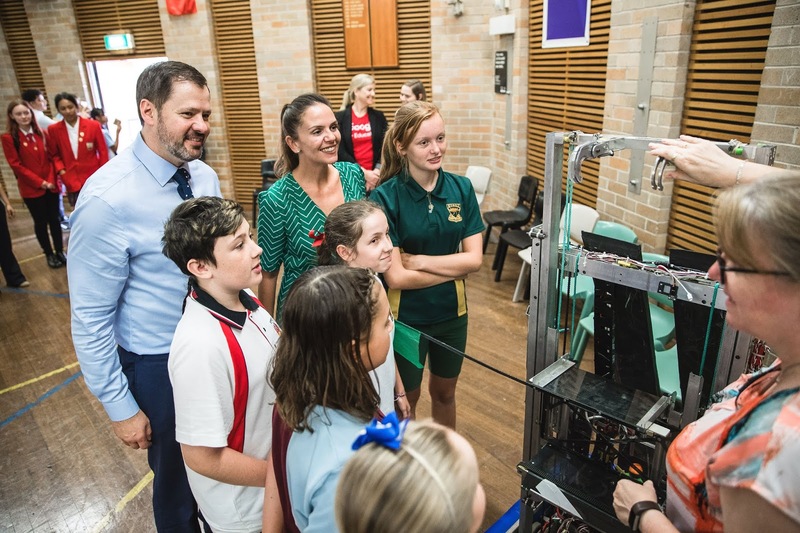 Thanks to Schools Plus for bringing this exciting opportunity to us and we can’t wait to work with students and teachers in Western Sydney to do great things with technology. Ever wanted to eat cupcakes with a robot? Ok us either... But more than 600 students from seven schools gathered at Doonside Technology High in Western Sydney and had the chance to do just that. They weren’t just bonding over the baked goods, they were learning skills of the future like STEM and computer science.